In my last few articles, I talked about how you can plan a trip to Gangotri; when would be the best time to go and presented a list of local tourist attractions. Continuing in the same series, in this post I will provide a more detailed description of places to visit in Gangotri; including their location and how to get there. The list below will include places that are located within Gangotri, as well as in its vicinity. Due to its religious importance in Hinduism, Gangotri is widely considered as a pilgrimage town only; which is actually incorrect. While it is true that the majority of the visitors that the town receives are devotees, the list does not really end there. Thousands of adventure seekers, photography enthusiasts, bikers and people looking to spend some time in peace too pick Gangotri as a desired destination. There are numerous tourist places in Gangotri that can keep you occupied for several days, weeks even. The entire route from Rishikesh to Gangotri, as a matter of fact, is a tourist belt. One after another you will keep coming across towns that are famous as a tourist destination. How many can you cover will only get limited by the time you have in hand. Below is a list of tourist attractions in Gangotri and its vicinity. While some of these attractions are either on the way or located within Gangotri, a few others may require you to trek for several kilometers. Mentioned below is a little more information on these places including their location. This by far is the biggest attraction of Gangotri. Bhagirathi is one of the two head-streams (or source) of the Ganges, the other one being Alaknanda. As per Hindu Mythology, Bhagirathi is the one that is considered as the actual River Ganga and the source stream; even though Alaknanda is larger in size and carries more water. Goddess Ganga decided to manifest herself in the form of a river and came down to earth on request of King Bhagirath. The place where she landed is Gangotri and she was called Bhagirathi after King Bhagirath. Bhagirathi Shila is the rock, where King Bhagirath is believed to have meditated during his years of continuous and intense penance while requesting Goddess Ganga to descend down to earth from heaven. The spot where this stone is located is in fact considered as the the site where Goddess Ganga first stepped down on earth. Gangotri Temple will come next in the list of places to visit in Gangotri. This 20-feet high marble built magnificent structure is believed to be over 200 years old. It was built by the Nepalese General Amar Singh Thapa and dedicated to Goddess Ganga. The temple opens in the first week of May, on the day of ‘Akshay Tirth’ and closes its doors on Diwali. The Aarti ceremony at the temple is one of the major attractions in Gangotri. During winter season the idols are shifted to Mukhimath village after the temple is closed. Gauri Kund and Surya Kund waterfalls are located about a kilometer ahead of Gangotri Temple. It is believed that Gauri used to take Bath here and hence the name. Another major attraction of Gangotri is the Jalmagna Shivling. This natural rock in form of a Shivling is named such because it remains immersed in the water for most part of the year; and is only visible during winters when the water level goes down. As per the mythology, this Shivling signifies the spot where Lord Shiva received River Ganga in his matted locks. This is a cave located about 1.5 kilometers from Gangotri and can only be reached by foot. It is named such after Pandavas who are believed to have lived and meditated here while on their way to Kailash. Gangotri Glacier is one of the primary sources of the Ganges as this is where the river Bhagirathi originates. It is one of the largest glaciers in the Himalayas running a length of about 30 kilometers. It is about 2 to 4 kilometers wide, with an estimated volume of over 27 cubic kilometers. 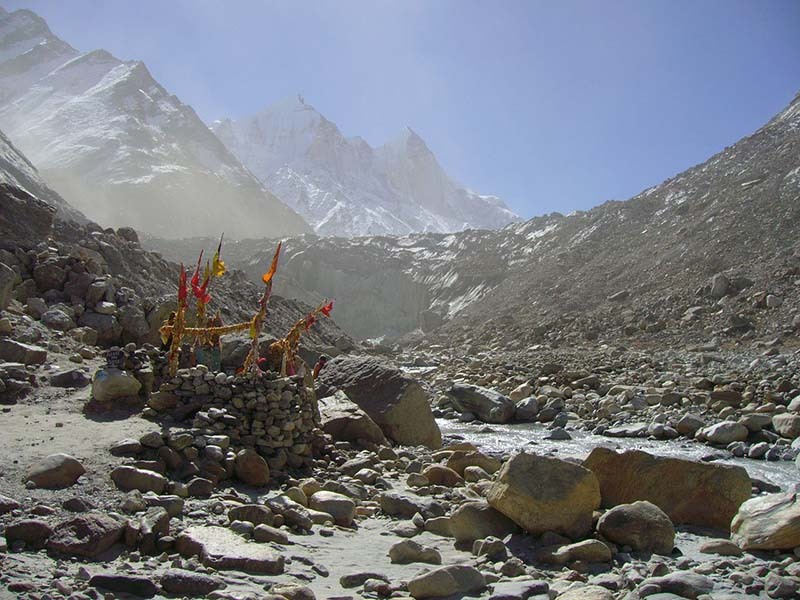 Considered as the birthplace of River Ganga, this glacier holds high religious importance. Gomukh, also known as “Gaumukh” or “Gomukhi” is the terminus or snout of the Gangotri Glacier from where the Bhagirathi River originates. It is like a giant hole in the glacier with water flowing out of it. The name “Gomukh/Gaumukh” literally means “Mouth of a Cow.” According to the legend, the snout in ancient times looked exactly like the mouth of a cow, and hence the name. Tapovan is a beautiful meadow located at a height of 4,460 meters. There is however no motorable road to the place and it can only be reached by a trek. Bhojbasa serves as a temporary accommodation for people trekking from Gangotri to Gaumukh. It is located about 13 kilometers from Gangotri and 4 kilometers before Gaumukh. There is nothing out here really as it is just a barren open land but it does provide stunning views of the Bhagirathi Peaks. Lal Baba Ashram and GMVN Bhojbasa Tourist Rest House here provide accommodation facilites for tourists. Like Harsil, Dharali is another village en route Gangotri which a lot of people prefer to stay at. It is located about 6 kilometers after Harsil and 19 kilometers before Gangotri. Both Harsil and Dharali are very scenically located villages on the banks of Bhagirathi; and can be a great place to stay if you did not find accommodation in Gangotri. Dharali too is famous for its apple orchards and red bean cultivation. Bhairon Ghati is located about 6 kilometers before Gangotri as you approach the town from Uttarkashi. The place is marked by the confluence of Jat Ganga and Bhagirathi River and is famous for the temple of Bhairav Nath located amidst lush green forest. Vishwanath Temple is actually located in Uttarkashi and not in Gangotri. It is believed to have been built by Sage Parashuram and houses the Kedar Khanda or Skanda Puran. The Shivlinga here is 60 centimeters tall and 90 centimeters in circumference; and draws many devotees from all over the country. Kedartal is a glacial lake situated at an altitude of 4,750 meters and 17 kilometers from Gangotri. The name of the lake literally means’Shiva’s lake’. The lake is fed by snowfall over its surrounding peaks and is the source of Kedar Ganga; which as per the mythology is Lord Shiva’s contribution to Bhagirathi. The lake is a popular trekking destination but must be attempted with proper guides and trekking equipment. It involves a steep rocky climb along the narrow Kedar Ganga Gorge and is dangerous at several places. Gangnani is a small town situated 46 kilometers from Uttarkashi on the route to Gangotri. It is located about 52 kilometers before Gangotri and is noted for its hot water springs. The thermal water spring is known as Rishikund. Most of the devotees going towards Gangotri take a dip in Rishikund before heading towards Gangotri. Apart from visiting all of the above-mentioned places, the two other things to do in Gangotri would be trekking and camping. The 17 kilometers trek from Gangotri to Gaumukh is among the favorite ones located in Uttarakhand and can easily be completed in 2 days. Some other treks that you can venture upon are towards Dayara Bugyal, Kedartal, and Dodital. While the trek to Gaumukh can be done on your own, please make sure that you are hiring a local guide and making proper arrangements for the others. These are not just some casual treks that you can venture upon. All these treks will take some planning and are a few days affair. I did not notice any campsites in Gangotri but there was one in Harsil. If you went trekking then overnight stays during all these treks will be in camps. If you are short on time and cannot cover all these places then you should keep the following places in your checklist. Bhagirathi – You will be driving right next to the river for most part of your journey. All these places are located within Gangotri Town and can easily be all covered in a day’s stay. If you can afford 2 days in total then you should also cover the trek to Gaumukh. In the next part of this article, I have provided a complete travel guide on how you can plan the Gomukh trek from Gangotri. Please click on the link below to continue reading. I hope the information above on places to visit in Gangotri was of help. If you have any questions; or need any further details; please feel free to ask in the comments section below; or at our Community Forum; and I will be glad to answer.